Kunming’s anti-PX protest movement broke through to new heights on Thursday as more than 2500 protesters took to the city’s downtown streets. 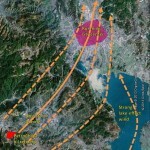 The unexpected success of this impressive NIMBY movement has empowered protesters to shift targets – what began two weeks ago as a movement opposing the construction of a polluting chemical plant attached to a PetroChina oil refinery 40km from the city center has evolved into a full blown protest against the entire 10mn ton oil refinery project. 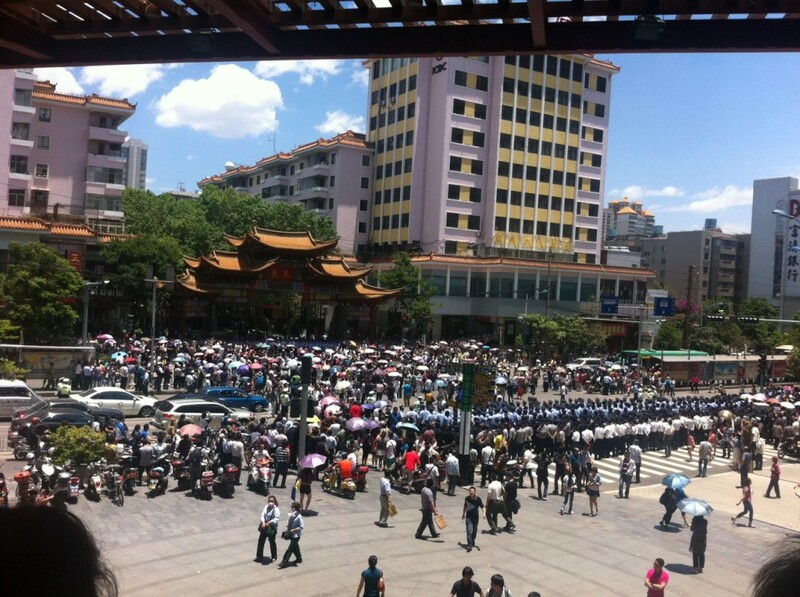 Throughout the morning the protesters worked a powerful and persistent ground game breaking through rank after rank of public security forces to gain total control of Kunming’s downtown streets by noon. 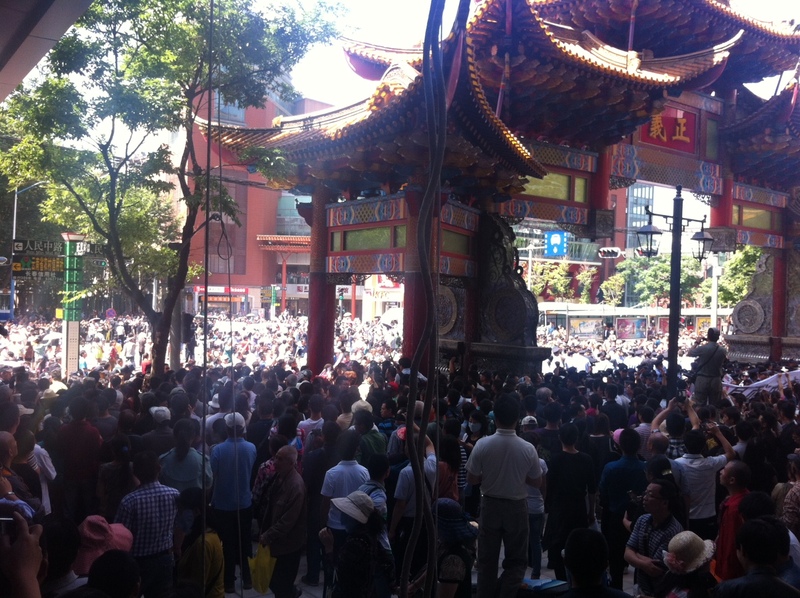 Protesters marched in peaceful and non-violent demonstration for more than five hours under the intense Kunming sun and prompted an engaging appearance of Kunming mayor Li Wenrong who sympathized with protesters and promised immediate change – another breakthrough victory for this growing social movement. It was a most unlikely victory at a most unlikely location coming at the most unlikely time. Unlike the 5/4 protest which was held on a Saturday afternoon in the middle of the city’s busiest commercial pedestrian square, protesters chose the provincial government headquarters as the protest site and a start time of 10am on a workday. The provincial government office sits at the end of Zhengyi Road, or Justice Road, a short and narrow street protected by the shade of giant oak trees and boxed in on the south end by a large ornamental gate. By noon, the gate 200m, translated as Justice Gate fittingly became the symbolic centerpiece of the day’s protest. At 10am public security forces outnumbered the loose crowd of 120 anxious onlookers 2-1. 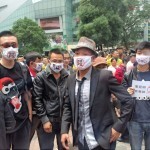 Unlike the 5/4 protest, thuggish plain clothes officers and deputized citizens stood among those who came to protest. No posters were displayed, no slogans shouted, and by 10:05am security forces had total control of the entryway to the provincial office. The protest appeared to be over before it began. After all it was declared illegal by the city government – an announcement was made over the weekend that anyone who showed up to protest on 5/16 would be arrested. 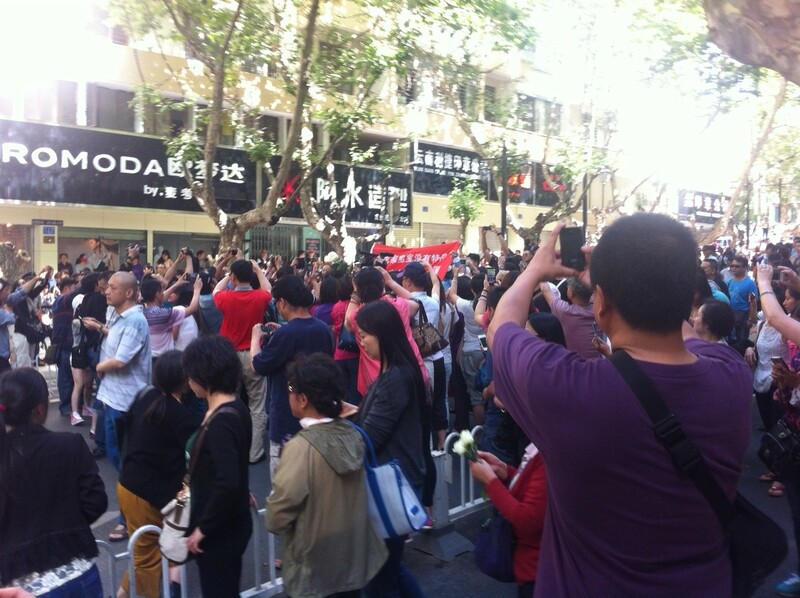 At 10:10am cheers erupted from the northwest corner of Zhengyi road where a crowd of sixty gathered. Plain clothes cops and middle-aged women wearing red arm bands discouraged onlookers from using their phones and tablet computers to take photos. “Taking photos will change nothing,” they said. A young man wearing an orange t-shirt emerged from the crowd and stood on the steps of a dental clinic to preach out against the Anning PX plant. He was immediately grabbed by plainclothes police and struggled as the thugs took him to a police van parked 15 meters away along the side of Zhengyi road. This unfortunate decision turned the tables on the security forces and sparked the reaction that started the protest. Scores of people ran in front of the van to prevent it from pulling away. The crowd spontaneously chanted in unison, “Release him! Release him!” and “Resist! Resist!” More onlookers, who had now unveiled themselves as rightful protesters piled in front of the van in the middle of the street. The masses of plain clothes cops peeled the protesters away from the van to give it safe exit. The prisoner was gone, no one was injured, but now hundreds of protesters found themselves in the middle of the street effectively shutting it down. By 10:15 this protest was on. 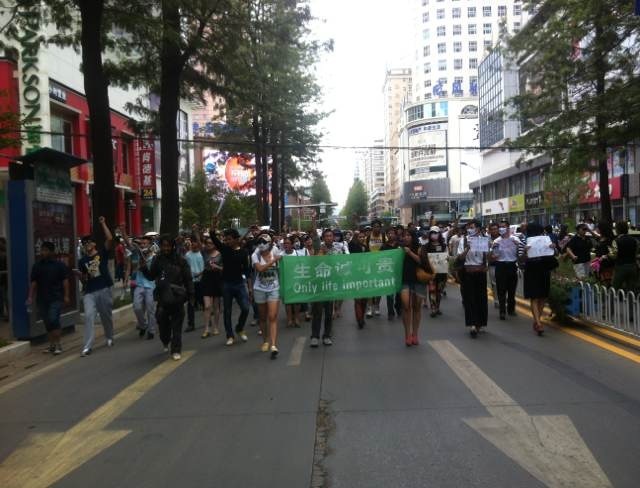 Then out came the banners, and the slogan “PX plant get out of Kunming!” rang out in chorus. The fervent crowd vindictively called for the release of the young man. Posters and flags sported the saying “To be or not to be: Kunming PX plant.” The police formed a human wall at the top of Zhengyi road effectively cutting off the government headquarters. A new crowd began to gather 200 meters south at the Justice Gate and a file of 50 security officers formed across the street to prevent the protesters from joining up with the new crowd of onlookers to the south. It appeared that the protest zone was being squeezed. The power of the masses sent a feeling of invincibility through the crowd – if the police made another attempt at arresting someone, the crowd was sure not to let it happen. A command must have come through the police forces to disengage with all protesters – touch no one, talk to no one, confiscate nothing. Around 10:45am after the protesters realized the rules of engagement had changed, the group slowly pushed their way through the police wall to the south to meet up with the crowd gathering at the Justice Gate. By then the mass had swelled to more than 1000. Justice Gate sits at the intersection of Renmin Road (People’s Road) one of Kunming’s busiest thoroughfares. Large shopping malls sit across the intersection and a pedestrian commercial street leads to the site of the 5/4 protest. The police forces were lax in allowing the group to migrate southward to the gate, after all, it led the protest away from the government headquarters, but they were determined to not allow the crowd to shut down traffic at the Renmin Road. A human wall of police officers five-thick formed to prevent the mass from breaking through the gate. Underneath the shade of the great oak trees, the protester’s energy seemed to stall out. New tactics like singing the Chinese national anthem with the words “Rise Up! Rise Up!” “Forward on! Forward on!” reinvigorated the group. Elderly women sang Red Songs from revolutions soon to be forgotten. Outside of the gate, the blazing sun lighting up the intersection provided contrast to the shaded area occupied by the protesters. It was at this moment that the movement changed. 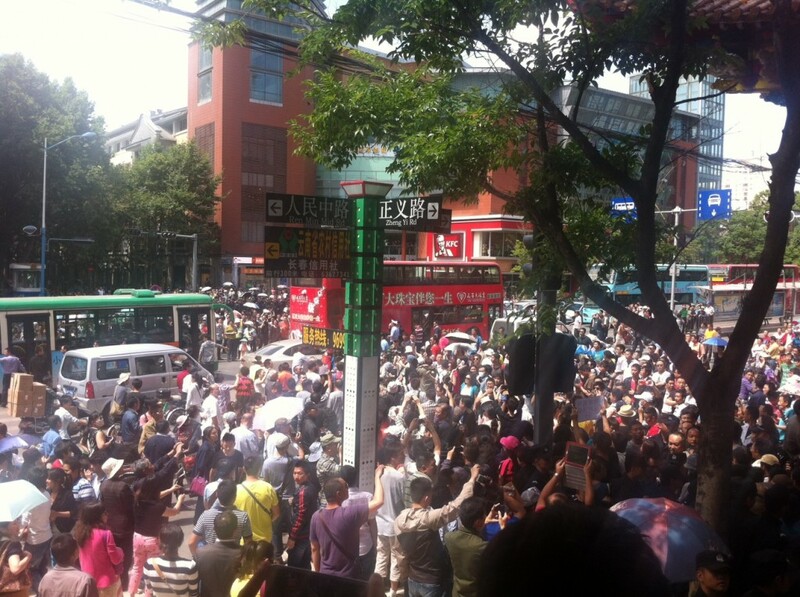 No longer were anti-PX slogans being shouted – the crowd shifted to “Oil Refinery Get out of Kunming!” Over and over. 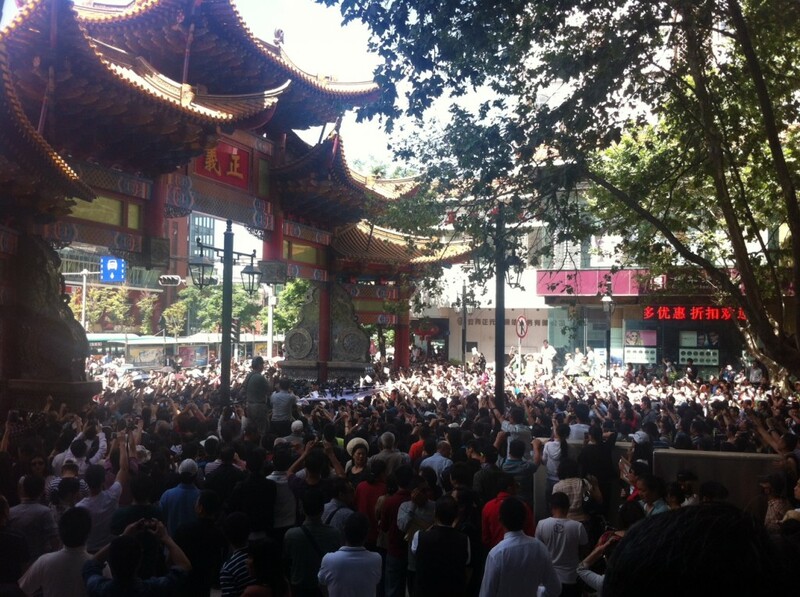 One woman shouted in Kunming’s local dialect, “Rise up Kunmingers! Rise up Yunnanese!” and the mass movement discovered a new slogan that hit very close to home. A new file of police rushed to prevent protesters from breaking out into the square, but their efforts were of no use. At 12:00pm the protesters broke through the police wall and shut down the busy intersection. Traffic going both ways on busy Renmin road reached a standstill. Storefront owners rushed out to see what was going on. 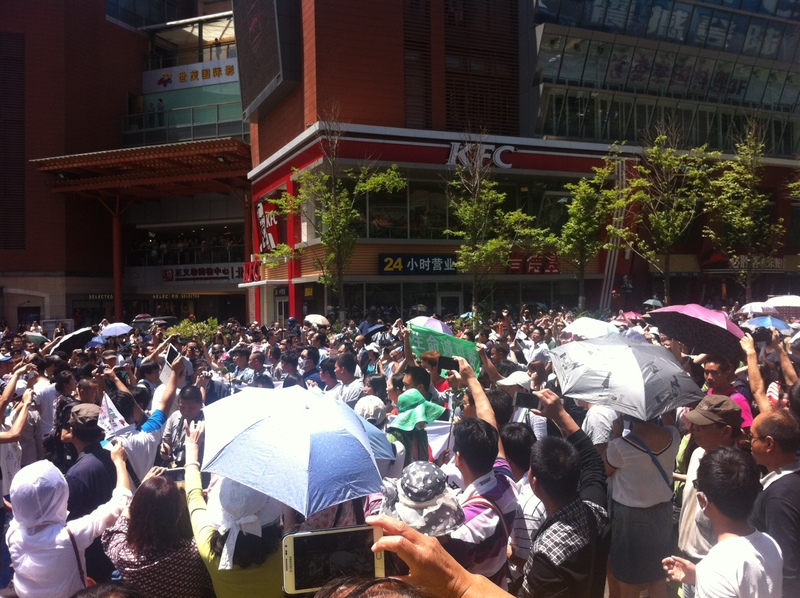 Crowds gathered on shopping mall balconies to cheer on protesters and take photos. The movement had emerged from the darkness into the light and gathered new steam. It didn’t take long for the group to communicate that fewer security forces were located outside of the gate along the intersection. This was victory, and the crowd controlled the streets. At 12:20pm the crowd now exceeding 2000 turned east on Renmin road for an impromptu parade march. They called for onlookers to join them and shouted their cause to passengers in public busses and cars now stuck in the middle of the road. The police changed tactics too – no longer were they corralling the crowd, they now were managing the crowd’s safe passage. More banners were unfurled. One poignantly called for Premier Li Keqiang to take command of the situation in Kunming. Foreign and domestic press took advantage of a plethora of photo opportunities. For the remainder of the afternoon, the crowd pushed the limits of its parade routes. First it marched in lap formation 500m east to the intersection at Qingnian Road and then back to the Justice Gate. Police attempted to restore traffic and at times the marchers marched through lanes of incoming traffic spreading their word to drivers waiting in cars. At 2:00pm, hundreds of marchers returned to the Qingnian Road intersection and instead of returning to Justice Gate, turned south and took their march on a two hour journey through the city’s streets. It was an envigorating experience. The movement was free. 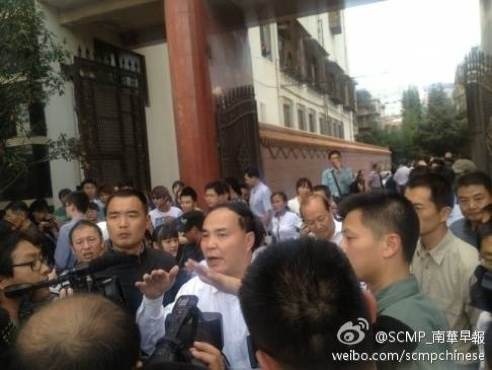 And then at 4:30pm Kunming city Mayor Li Wenrong met the marching protesters outside of a military compound. Megaphone in hand, he apologized to the group and gave a traditional bow. He passed the megaphone from protester to protester offering a rare opportunity of free speech and direct communication with a Chinese government official. Protesters asked him how much he cared about Kunming and whether or not his family lived in the city. His answers: I care about Kunming’s blue skies as much as you do and I’ve moved my parents and two sisters to Kunming. This empathetic response soothed the crowd and demonstrated Li Wenrong as a compassionate public official. By the end of the encounter, the mayor promised to increase transparency by opening a Sina Weibo microblog by noon today and host a public hearing by Wednesday May 22. He also emphasized to the protesters that he will personally oversee the release of environmental impact assessments concerning the oil refinery and any decisions on the future of the refinery will be made through democratic processes. He also announced, to the supreme delight of the crowd, that the morning’s prisoner had been released. This is how collective action can work in China and force change to policy agendas. 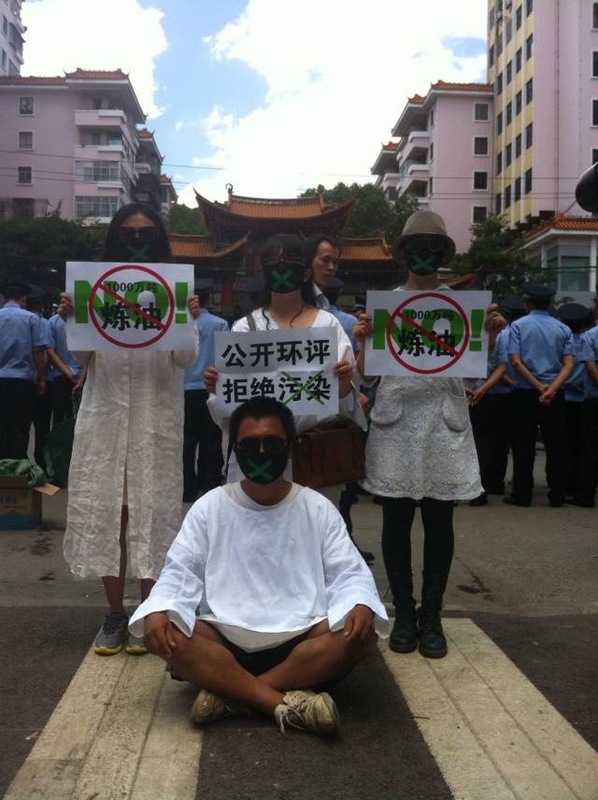 Protesters now empowered by their unexpected victory on 5/16 are shifting their focus from a protest against the oil refinery’s auxiliary PX project to trying to shut down the entire PetroChina oil refinery project or move it further away from Kunming. The power now lies in the hands of this unstoppable force.